To make the mark that Taipuva is present in Stockholm area, we invited some of our beloved customers and other guests to a Breakfast Seminar at Siemens offices in Solna. The concept was simple: after a short introduction we were served with three real cases from our customers, along with a good breakfast. We are a Smart Expert Partner to Siemens and a reseller of Polarion ALM. Polarion ALM is a comprehensive lifecycle management tool and therefore it is difficult to just scratch the surface and to fully understand what it can do for a company in a short time so we went deep in the case stories. 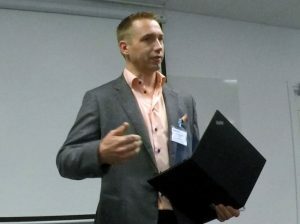 Tommy Hedqvist, Portfolio Development Executive EMEA/Nordics from Siemens, set the scene and talked about digitalization in product development. He also spoke about Siemen’s Partner strategy which nicely gave the floor over to us. In my presentation I went through the fundamentals of Polarion, since everyone isn’t a user yet. Following this the good stuff started! 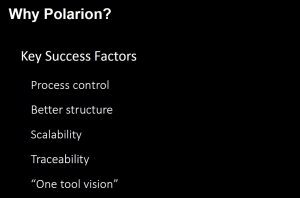 Mattias Windå, Key System Architect/Chief Program Architect from Tobii, shared both the reasons to select Polarion and also on how they have built up the tool and use it to strengthen their process. Mattias gave a holistic view on the system engineering and how to use Polarion in such an environment. He went through and shared examples on all the above areas from Process control to the “One tool vision”. His material is available here. Per Anders Stenberg, Project Manager at SNC-Lavalin Rail & Transit AB, shared on how to manage project risks when you have a portfolio of projects – in his case the upgrade of the commuter train; Roslagsbanan in Stockholm. So we went deep into project risk management and saw an abundance of Pie-charts and matrices. 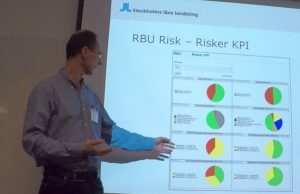 There are six projects running in the program and before all of them had their own project risk management as isolated Excel documents, with the new approach, each project still manage their risks, but Per Anders have created reports visualizing all the project risks within the program. See the report examples in his presentation. The final part of the Breakfast Seminar was done by Ola Larses, our Lead ALM Consultant, on a case how our customer has streamlined their RFQ process (request for quotation). This is all automated on Polarion, which removes many manual phases. 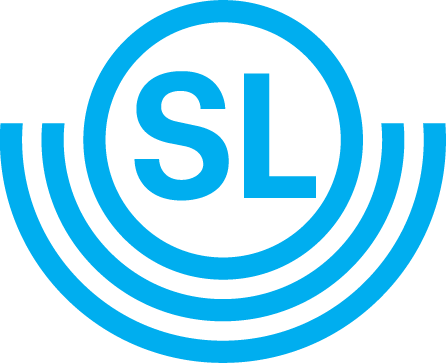 As all the information is kept in one tool, it allows fast starting of the project once the supplier has been selected. It further eases the verification that the original requirements for the project are met. 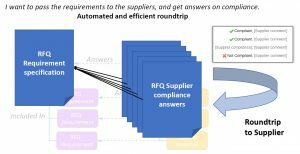 The figure below shows, how Polarion’s reuse and MS Office roundtrip functionalities automate the communication of requirements and supplier compliance. If you’d like to know more, reach out to me to discuss further, or book a demo on the RFQ case. The material shared during the sessions is available here! Om något av detta verkar användbart för dig, tveka inte att kontakta mig!